Europe is within easy reach on this incredible fly, tour and cruise package. Take in world-famous landmarks, sample the delights of European culture, and cruise the sparkling Mediterranean. This unforgettable Continental adventure showcases the very best of Paris, Venice, the French Riviera, the Greek Islands and beyond. Tick off the highlights of Europe on this spectacular 18 day journey by land and sea. See the Eiffel Tower and Notre Dame Cathedral on a city tour of Paris, travel to Cannes by high-speed train, and visit Nice on the stunning French Riviera. Wander the romantic streets of Venice, and explore the historic city of Florence. 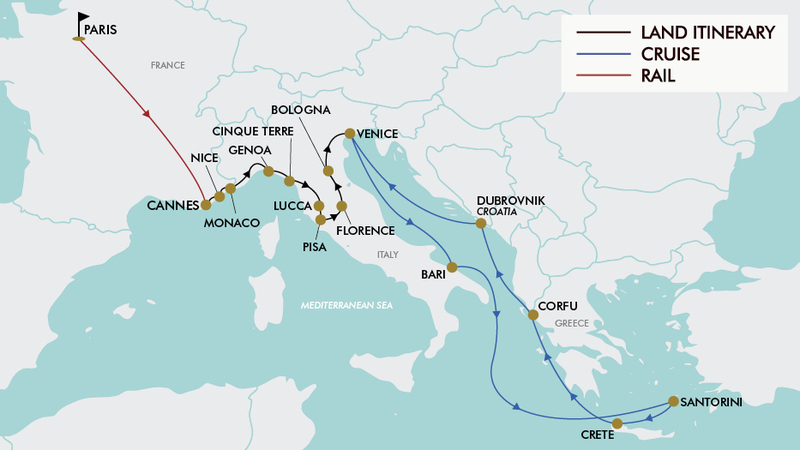 Experience a thrilling seven night Mediterranean and Greek Islands cruise aboard the MSC Magnifica ship. Explore the ancient city of Bari, Italy before heading to the magical Greek Islands of Santorini, Crete, Corfu and visit the stunning port town of Dubrovnik in Croatia. Includes eight nights accommodation on tour, a seven night cruise, 29 meals including daily breakfast and all meals while cruising, English-speaking tour leader, and much more. Today depart from either Sydney, Melbourne, Brisbane, Adelaide or Perth for your flight to Paris, France. Fly with award winning airlines such as Emirates, Etihad Airways, Finnair, British Airways or Cathay Pacific to name a few (subject to availability). Day 2 Welcome to Paris! Upon arrival into Paris you will be welcomed and transferred to the hotel. Today enjoy a full day Paris city highlights tour. See the Eiffel Tower, Notre Dame, Seine River bridges, Arc de Triomphe, Champs Elysees, Place de la Concorde and walk the famous Saint Germain neighbourhood. Enjoy the remainder of the day free at leisure in this beautiful city. This morning travel aboard the TGV high-speed train to Cannes on the glittering French Riviera. Best known for its annual film festival, the coastal city is brimming with luxury hotels, sunny seaside restaurants, and gorgeous stretches of beach. From Cannes, travel along the scenic Riviera to Nice, arriving in the late afternoon. After breakfast enjoy a panoramic tour of Nice and then continue onto Monaco, the city of Prince’s. View the classic Monte Carlo Quarter with its famous casino and then enjoy a coach tour along the very same road the famous F1 Grand Prix operates on. Continue onto Italy and spend the night in Genoa. This morning enjoy a scenic drive to the stunning Cinque Terre region. Together with your tour leader board the local train (tickets included) – to visit the famous Cinque Terre villages of Riomaggiore, Manarola and Vernazza. The Cinque Terre or “The Five Lands” are famous for their natural beauty, steep cliffs and mountainous terrain extending inland. As such, the villages and the carefully terraced lands have kept their original charm. Afterwards drive to the Pisa region for the evening to retire in the Lucca area of Tuscany. Today head to Pisa and marvel at the unique leaning tower. Continue onto Florence. In the afternoon enjoy a walking tour of the historical centre and view Santa Maria Novella, Ponte Vecchio, the Duomo and Piazza della Signoria. After breakfast head north and arrive in Bologna for a lunch stop (not included) and free time to walk around this lively historic city, renowned for its culinary traditions. Bologna has given its name to the well-known Bolognese sauce, which in Italian is called ragù alla bolognese. Afterwards continue onto Venice to enjoy an afternoon walk through Piazza San Marco with the tour leader and perhaps take the opportunity to experience a gondola ride (not included). Today enjoy a full day city tour, beginning with a walk along the canals. As you explore, admiring the cobbled laneways, colourful trattoria cafes and beautiful piazzas, it soon becomes clear why this city is considered among the most romantic in the world. See the Rialto Bridge, Doge’s Palace and Torre dell’ Orologio. At the end of the tour you can choose to either walk with the tour leader back to the hotel or purchase a vaporetto ticket (not included) to cruise down the Grand Canal. After breakfast be transferred to the cruise terminal to embark on your magical 7 night MSC Greek Islands Cruise aboard the ‘MSC Magnifica’. The cruise will depart at 5:00pm. The jewel in the Greek Islands crown 'Santorini' will offer opportunities to take photographs on every corner of this volcanic island in the Cyclades, with its incredible variety of landscapes and its crystal clear sea. Chania is a city on the northwest coast of the Greek Island of Crete. It’s known for its 14th-century Venetian harbour, narrow streets and waterfront restaurants. On the northern most edge of the Ionian islands, with its lush vegetation and picturesque coastline, you'll find a unique mosaic of cultural and artistic influences. A walled, sea-battered city lying at the foot of a grizzled mountain, Dubrovnik is Croatia’s most popular cruise destination, and it’s not difficult to see why. This medieval town was reshaped by Baroque planners after a disastrous earthquake of 1667; Dubrovnik’s historic core seems to have been suspended in time ever since. This morning dock back into Venice and after disembarkation (please allow approx. 2 hours to disembark) you will need to make your own way to the airport for your return flight back to Australia. Travel offer is valid for travel on selected dates until the 28th October 2020. Please note: dates/months with a * incur a cruise high season surcharge of $300 per person. Etihad Airways, Emirates, British Airways, Singapore Airlines, Cathay Pacific, Virgin Atlantic, Royal Brunei, Lufthansa, Swiss Airways, Austrian Airlines, Scandinavian Airlines, Qatar Airways, Air France, KLM, Finnair, Virgin Australia, Thai Airways, Korean Airlines, Malaysia Airlines, China Southern Airlines, China Eastern Airlines, Turkish Airlines, Oman Air, Garuda Indonesia, Vietnam Airlines, Air China, China Airlines, Malindo Airlines plus any codeshare partners (subject to availability). - Enjoy a wide choice of superb cuisine to celebrate the tastes of the Mediterranean with a chance to indicate preferred dinner sitting. - Access to gourmet buffets with 13 different gastronomic corners open 20 hours a day. - Daily cabin service and goodnight turn down service. - Cabins on the upper decks and in the most convenient positions on the ship. - Priority in choice of dinner sitting. - Complimentary continental breakfast on every morning except morning of departure. - Cabin service 24 hours a day. - Paris, France (Pre Tour): $280 per room including breakfast. - Venice, Italy (Post Tour): $180 per room including breakfast. Minimum group size 25, maximum group size 44 per vehicle. - prices are based 2018/19 rates and my change slightly in 2020. - Mandatory city taxes/check point fees: approx. €14 payable on tour (please note pricing is subject to change). - Transfer cruise port to airport (day 17).